The first thing I like to make when I pull full-flavored, homegrown tomatoes off the vine is my quick gazpacho. 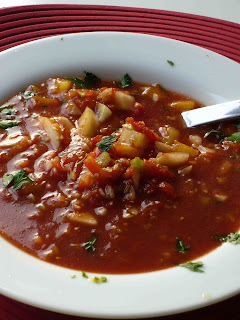 I've always loved gazpacho, but got tired of all the chopping and prep work involved in it. I make this version in my Cuisinart and it makes really quick work of it. This may thicken if you let it hang out in the fridge. I always keep extra tomato juice to thin it out if necessary. Cut bell pepper, cucumber, celery and onion into large chunks. Put garlic into food processor and pulse until finely chopped. and bell pepper, cucumber, onion and tomatoes to the food processor and pulse until roughly chopped. Remove vegetables to a bowl and add worcestershire, olive oil and salt and stir to combine. Stir in tomato juice and let chill in the fridge for at least two hours to let all the flavors meld. Enjoy! You have a nice site. Found you on the Foodie Blogroll. The gazpacho soup recipe is very tempting.